Garden City took down Wichita South, 21-6, in a match-up of two undefeated teams . The Buffaloes took advantage of two interceptions that turned into two touchdowns. Tye Davis picked off a Wichita South tipped pass that turned into a 56-yard scoring drive, and Zeke Herrera took the second interception to the house to secure the win. Manhattan ran over Topeka Highland Park 50-6 on Friday night. The Indians rushed for seven touchdowns and over 300 yards in the win. Ian Trapp ran for 131 yards and two touchdowns while Kevontae McDonald rushed for three more touchdowns in the Indians’ win. Washburn Rural got back on track with a 31-7 win over Shawnee Heights. Junior Blues sophomore quarterback Jordan White threw for 188 yards and accounted for two touchdowns in the win. Running back Hunter Browning also found the end zone twice in the win. Gardner-Edgerton shut out St. James Academy in the second half to come away with a 24-14 win to earn their first victory of the season. The Trailblazers were led by quarterback Griffin Johns who completed 16-of-21 passes for 212 yards and two touchdowns. The Thunder were held to just three possessions in the second half as Gardner Edgerton controlled the time of possession and dominated both sides of the ball on third down. The win was the 250th in Gardner-Edgerton coach Marvin Diener’s career. Goddard scored 36 combined points in the second and third quarter and cruised to a 50-14 win over Andover. Despite giving up an opening drive touchdown, the Lions scored the next 43 points of the game that blew game wide open. Kody Gonzalez rushed for 124 yards and two touchdowns to lead the Lion offense. Topeka Seaman remained undefeated as head coach Glenn O’Neil picked up career win No. 100 in the Vikings 14-0 win over rival Topeka Hayden. With their third win of the season, Seaman has already surpassed their win total from a year ago (2-8). Kevin Moranz caught a touchdown pass from Dalton Cowan and Simeon Sykes returned a fumble for a 34 yard touchdown to provide the only scoring in the game. Valley Center traveled to Arkansas City and dominated all facets of the game to come away with a 29-7 win. The Vikings were led by quarterback Wyatt Lange who completed 10-of-13 passes for 164 yards and two touchdowns. The Valley Center defense did not allow a single point until the last minute of the game when Corbin Hockenbury found the end zone from six yards out. Kapaun Mt. Carmel improved to 2-1 on the season after a 25-6 win over Wichita East on Thursday night. The Crusaders defense posted a shutout in the second half to preserve the win. Tate Heiland found the end zone in the Crusaders win. Fort Scott improved to 2-1 on the season with a 22-0 shutout of Chanute. Junior running back Zarek Fewell carried 32 times for 232 yards and two touchdowns in the win. For the season, Fewell has 442 rushing yards and four scores. Abilene remained undefeated after a 25-7 homecoming win over Andover Central. Quarterback Ryan Wilson accounted for three touchdowns in the win that was highlighted by a 64 yard touchdown pass to Carter Wildey. Parker Base was on the receiving end of Wilson’s other touchdown pass in the Cowboys win. Atchison cruised to a 40-12 win on Friday night over KC Schlagle. The Redmen scored four touchdowns in the first quarter behind quarterback Adam Smith. Smith threw two touchdowns and rushed for the other two scores in the opening quarter. Augusta improved to 3-0 on the season after a 33-8 win over Towanda-Circle on Friday night. Chance Whitehead threw for 248 yards and three touchdowns on just six completions. Luke Dockers had 163 receiving yards and two touchdowns on his only two catches of the night. KC Piper came away with a 33-20 win over Bonner Springs to improve to 2-1 on the season. The Pirates rode the legs of senior running back J.J. Letcher who rushed for 227 yards on 37 carries. Letcher was able to find the end zone one time in the win. Quarterback Jordan Goodpaster threw from 154 yards and two scores in the Pirates win as well. Pratt continued to roll on the offensive side of the ball as they outscored Nickerson 55-26 to remain undefeated. Hunter Kaufman and Travis Theis combined to rush for 278 yards and six touchdowns in the Greenbacks win. Kaufman accounted for four touchdowns, while Theis found the end zone twice. Santa Fe Trail used the ground and pound game on way to a 42-14 win over Anderson County. The Charger rushing attacked combined for 340 rushing yards on 43 carries and four touchdowns. Peyton Newton led the way with 160 yards and two touchdowns while classmate Gage Greenfield rushed for 113 yards and two scores of his own. Scott City blew out Cimarron 52-7 to earn their first win of the season. Beaver quarterback Bo Hess threw for 186 yards and three touchdowns to lead the way for Scott City. Wyatt Hayes led the rushing attack with 88 rushing yards and one touchdown. Smoky Valley improved to 2-1 after a 28-12 win over Haven on Friday night. The ground game was the answer for the Vikings all night as they rushed for 433 yards and three touchdowns. Junior running back Kyle Anderson accounted for 339 of those rushing yards and two of the three rushing touchdowns. Conway Springs delivered a 47-6 home victory versus Douglass. Conway scored 20 points in the first, 15 in the second and six in the final two quarters. Quarterback Colton Terhune ran 19 times for 259 yards and tallied touchdowns from four, 13, 28 and 80 yards. Terhune also threw a six-yard touchdown pass to Trenton Jones. He completed 4 of 7 passes for 32 yards with the TD. Jones also tallied scoring runs of 20 and 16 yards, both in the first quarter. Sabetha, coming off a Week 2 victory versus Holton, rolled over Jefferson West, 46-0, behind five touchdowns from Blake Plattner. He scored from 25, six, three, seven and four yards out. Plattner had 21 carries for 140 yards in the game to push his season total to 370 yards and nine touchdowns. Trae Snyder added 157 rushing yards and a touchdown on 13 attempts. Snyder leads Sabetha with 503 yards and five scores this season. Southeast of Saline defeated Russell, 42-20, in NCAA action. SE of Saline quarterback Bryce Banks helped the Trojans open a 12-0 lead after the first quarter and lead 28-7 in the second quarter. Banks completed a 14-yard TD pass to Ben Murray and then rushed for a 51-yard score. In the second quarter, Banks found Murray from seven yards out. They also connected on an 81-yard passing touchdown for the game’s final points in the third quarter. Osage City defeated Olpe, 35-33 after the Indians trailed 21-0 at halftime and 33-7 mid-way through the fourth quarter. Osage City outscored the Eagles, 28-6 in the final seven-and-a-half minutes. Tucker Kimball rushed for three scores of 11, 20 and 50 yards, and threw a short touchdown pass to Brett Sage with less than a minute left to give his team the lead. Brayden McDowell converted all five of his extra points. The game was the first matchup between the two schools since 2009. Mission Valley improved to 2-1 with a 44-15 victory against West Franklin. Clay Phillips had five touchdowns on runs of 20, 70, 20 and 78 yards, and tallied a 61-yard interception return for a score. The Vikings broke the game open with 26 points in the third quarter. Jackson Heights defeated Oskaloosa, 46-7, and moved to 3-0. Oskaloosa bumped to 2-1. The Cobras scored 28 points in the first quarter and 18 in the second. Mason Hamilton scored on a 53-yard and 36-yard passes from Wyatt Olberding. Hamilton also scored on runs of 57 and 32 yards. Olberding added a pair of nine-yard TD runs. Jefferson Co. North received three passing TDs from Boston Lane and moved to 3-0 with a 22-6 victory against Pleasant Ridge. Lane tossed 60- and 47-yard scoring passes to Brayden Summers and a two-yard pass to Joel Abel. As well, Lane completed a two-point conversion to Abel. The Chargers scored one touchdown in each of the first three quarters. Smith Center bounced back from two season-opening losses to Plainville and Phillipsburg with a 62-0 home win versus winless Thomas More Prep. Kaden Meitler scored two early touchdowns, and the Redmen led 14-0 with 2 minutes, 36 seconds left in the first quarter. Early in the second quarter, Meitler fumbled, though David Hileman picked it up and rushed 59 yards for a score. Colton Hutchinson started at quarterback for the second straight week after an injury to starter Thayne Benoit. Ellis rolled to a third win of the season by beating Sublette, 50-2. Clay Feik led the Railroaders with 107 yards rushing on just five carries. Quarterback Easton Smith completed four of his six attempts for 85 yards and a touchdown. Ellis held the Larks to 14 rush yards on 27 attempts. Victoria won its second straight, 56-18, versus Ellinwood and moved to 2-1. Collin Kisner rushed for five scores and Bryant Karlin scored twice. Kisner rushed 19 times for 226 yards. Victoria will play host to Otis-Bison (2-1) in its Homecoming contest Friday. WaKeeney-Trego is 3-0 for the first time since 1984 after a 46-0 road win versus Quinter. Keagan Shubert passed for 85 yards and four touchdowns versus the Bulldogs, who remain winless in the last two seasons. Junior Brendan Flax has four interceptions, second-most in Eight-Man, Division I. The Golden Eagles will play Sharon Springs-Wallace County on Friday. Herington, in its first season of eight-man football, has opened 3-0 with a 74-38 victory against Bennington, 56-40 versus Solomon, and 30-16 last week in a home game versus Centre-Lost Springs. Senior Jonathan Lollar leads eight-man players with six interceptions, including two in each game. He also has defended five passes and recovered two fumbles against Solomon, which played in the Eight-Man, Division I sub-state championship game last season. Herington was tied at eight at halftime last week before outscoring the Cougars 14-8 in the third quarter. Lollar had three catches for 81 yards and two scores. Logan-Palco’s David Thompson continued his great season with four scores and 152 rushing yards in a 50-0 win versus Thunder Ridge. The Trojans (3-0) received 64 passing yards and a touchdown pass from Josh VanLaeys. Thompson scored on rushes of 15, four, three and 37 yards. Clifton-Clyde moved to 3-0 with a 47-0 victory versus Valley Falls. Caleb Charbonneau had a standout game with touchdown runs of one and three yards and completed touchdown passes of 24 and 14 yards to a pair of receivers. Macksville picked up a 40-22 win at Kinsley on Friday night. It was just the third win for the Mustangs since the beginning of the 2013 season. During that span, Macksville has posted a 3-27 record with the other two victories coming against the St. John Tigers. Macksville will host St. John in Week 4. After a pair of losses by a combined eight points against St. Francis and Atwood-Rawlins County, Sharon Springs-Wallace County, playing without standout Grady Hammer for the second straight contest, won at Hoxie, 30-22. Senior Levi Johnson played well at quarterback with eight of 11 passing for 159 yards. The Wildcats had 47 carries for 102 yards and four touchdowns. Junior Seth Johnson caught four passes for 80 yards. Five players had at least 12 tackles for the Wildcats, and Levi Johnson picked off two passes. Wallace County is 6-1 against Hoxie, including six straight victories by eight, 14, eight, eight, 30, and eight points. The Wildcats’ defense limited Hoxie to 6 of 17 passing for 88 yards and 35 carries for 188 yards. Caldwell’s offense continued to roll in a 54-6 victory against Central Burden. Caldwell scored 22 points in the first quarter and 32 in the second in a game that was called at halftime. The Bluejays ran 24 plays for 305 yards, while the Raiders finished with 31 plays for 75 yards. Colten Ward completed 3 of 4 passes for 98 yards and two touchdowns, and rushed three times for 71 yards, including a 46-yard score. Dakota Volavka tallied seven rushes for 76 yards with rushing scores of two and 40 yards. Caldwell leads the state in scoring with 196 points. Hutchinson Central Christian, back in KSHSAA football for the first time in many years, has opened 3-0, including a 70-14 road victory versus Stafford, a team the Cougars lost to in 2015. The Cougars finished 4-5 as a club team last fall. Central Christian opened with a 54-22 home win versus Pretty Prairie and then won at Pratt Skyline, 36-12. Dighton has started with three straight shutouts and has outscored opponents 151-0, including a 49-0 home victory versus Leoti-Wichita County last week. Senior Tyler Lingg, a four-year starter at quarterback, completed 9 of 11 passes for 162 yards with two scores versus no interception. Senior Lake Lewis had nine carries for 100 yards and three touchdowns. Senior Dylan Foos caught five passes for 129 yards and a pair of scores. The Manhattan-Flint Hills Christian Eagles shut out Veritas Christian 14-0 to improve to 2-1 on the season. Derek Bowman broke free for a 40-yard touchdown in the first quarter to give the Eagles an 8-0 lead. Bowman laster tossed an 18-yard touchdown pass to Dylan Peters in the fourth quarter to complete the scoring. 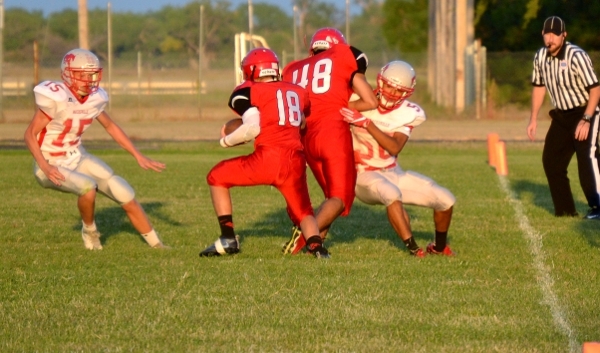 Golden Plains remained unbeaten with a 49-0 shutout of Cheylin. Sophomore A.J. Camacho rushed for 131 yards and two touchdowns, and returned one of his two interceptions 79 yards for a score. Camacho was just as deadly in on special teams where he returned a kickoff 70 yards for a touchdown and a punt 55 yards for another score. Manual Castillo led Cheylin with 68 yards rushing on ten carries and 43 receiving yards on four receptions.